From April through June there are huge schools of tarpon migrating through Big Pine Key and Capt Jim knows where to find them and how to catch them. If you’ve ever wanted to do battle with a really large fish, this is a perfect opportunity. Tarpon are hard fighting, and will not give up easily. You have to keep working on bring them to the boat, because if you rest so will they. Then the fight starts all over again! 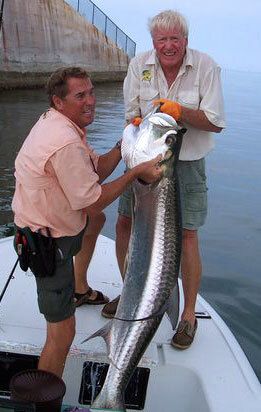 Florida currently holds 29 world records for tarpon. In 1982, Billy Pate set a fly fishing record on 16-pound tippet with a 188-pound tarpon. For the next 19 years, some of the world’s best fly fishermen and guides attempted to break Pate’s record and become the first angler to land a tarpon on fly fishing tackle that was over 200 pounds. The Florida state record for tarpon caught with conventional tackle is 243 pounds, caught by Gus Bell in Key West in 1975. The all-tackle world record (additionally certified as the 80-pound class record) for a giant tarpon is 286-pounds, 9-ounces caught by Max Domecq in Rubane, Guinea-Bissau, Africa on March 20, 2003. Live bait tarpon fishing is done in the shadow of the Bahia Honda bridge. The Bahia Honda bridge offers one of the Keys most picturesque backgrounds as well as sheltered waters.